As part of the Porterhouse Medical Group’s mission to help improve people’s lives, we use our communications expertise to raise awareness of diseases, and participate in many fund-raising activities for charity. We also adopt a local charity to fundraise for each year. Last year, we had an enjoyable and often energetic time supporting SportsAble. As its name suggests, SportsAble is dedicated to supporting people with disabilities through sport and social activities. With the aid of special sporting facilities, they help individuals to take control of their lives and become more active and able as they strive to achieve personal and sporting goals. The decision to support this charity was met with great enthusiasm by the Porterhouse team, and we are proud to have raised £2,544 for the charity. Our Porterhouse power athlete Madeleine performed amazingly well in her sponsored triathlon, contributing to this total. We also had a team-building day at the centre run by SportsAble in Maidenhead, competing in wheel chair basketball and archery. In March, some of the team ran the Reading Half Marathon, and much fun was had competing in the SportsAble Static Wheelchair Push Challenge at our offices in the summer. 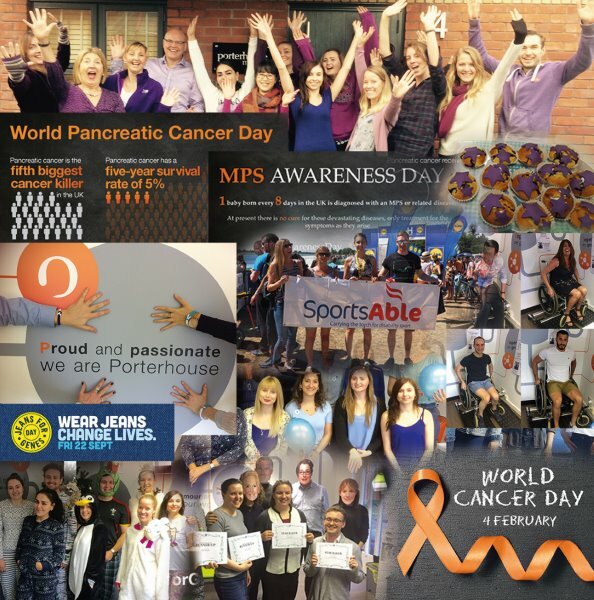 Other disease awareness and fund-raising activities were carried out throughout the year for World Cancer Day, MPS Awareness Day, Jeans for Genes Day and World Pancreatic Cancer Day. They involved our team dressing in different colours, a Christmas jumper day, loads of bake sales, and social media posts being shared about our activities and about common disease symptoms. We will soon be announcing our charity partner for 2018 and are looking forward to supporting another great local cause. Watch this space!